"An awesome alternative to the usual refried beans and tortilla chips. 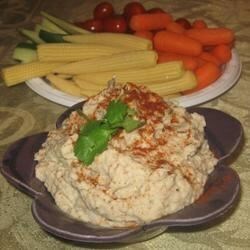 Serve this dip with pita chips or veggie wheat crackers"
In a food processor, combine the cannellini beans, cilantro, garlic, olive oil and lemon juice. Process until smooth, or to your desired consistency. Taste, and season with salt and pepper. it tastes great with pita chips but I also think the lemon was to over powering. Great stuff...a dip that tastes great and is not full of saturated fat. Try it with pita bread that has been cut into triangles and baked with herbs until crisp. This is better as a spread for a sandwich or wrap, than a party dip.